(Camera: Sony a55)Here are the rest of the shots taken at the cosplay day of which some were featured in an old post. "Is this the real life? Is this just fantasy", goes the background music Bohemian Rhapsody by Queen. How befitting!All shots were done not right in front of the cosplay participants. The camera was mounted with a long zoom lens. This was not because the author was shy, but that a few steps backward could give the images a better storytelling quality. (Camera: Panasonic GF2; the background music is a popular CNY tone)Hong Kong has a great atmosphere during the Chinese New Year. It is probably the best place to experience the Chinese festive celebrations. There are lots of actions going on in town apart from the publicly sponsored New Year Day parade and the fireworks on the following day (that is, tonight).There is one activity which should not be missed but by the time you are reading this, you have missed it. The Chinese New Fair is a must-go for the Chinese on the New Year's eve. This is not because they have any particular thing in mind to buy. More often than not, they are just going on a Hang Dai Wan, the Cantonese expression literally meaning walking around to get a big fortune/ a lot of luck. Walking around among the crowd without intent and seeing the young vendors peddling for business were great fun. When you come across or, even better, anticipate a scene, what is happening in your mind? Maybe you will be silently figuring out the technical combos, the composition or the desirable shooting angle. Then, you have probably skipped an essential step which is usually overlooked. If the photographer is a voracious reader, to begin with, he or she will conjure up similar images or related stories. These elements are conducive to the anticipation of and also a richer texture in the final image. Creativity is not all cultivation of novice ideas. Before these novice ideas arise, there should be first and foremost the cultivation of the mind. 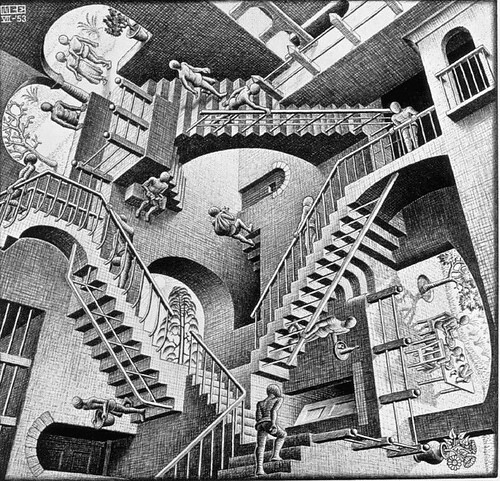 For today's image, the author anticipated that the passer-by would walk up the stairs while subconsciously recalled a well-known illustration of optical illusion. Since the camera was kept turned on and preset, the only thing to be done was to walk up to the location and wait for the scene to present itself. With camera makers churning out new replacement models at shorter intervals, the fun and games begin when photography newbies and old hands, especially newbies, in the process of making a purchase try to put the products in perspective. Occasional questions sent to GX Garnerings do reveal the problem. Recently, a photographer asked about the best fixed 28mm lens camera for street and travel photography. The names on his list were GRD3, GF2 and NX10. The enquirer also wondered how the GRD3 performed compared to the Fujifilm 200EXR he was currently using in addition to his Leica D-Lux4. These cameras are very different indeed. For most prospective buyers, cameras are unlike pudding which can be eaten to get the proof at a negligible price. So we dig into reviews. But the deeper we dig, the more irritated we will probably become -- there are just too many similar cameras for a limited budget. Photographers must avoid producing images which are commonplace and humdrum to the viewers. But many a time even the intriguing photos may capture your attention for a a short while, but slip out of your memory soon. The reason is probably that they lack punch in terms of "texture" which merges the "genius loci" or sense of place into the final images. The way to overcome this is by repeatedly contemplating and experimenting methods to remake a scene into an image which is iconic of the place or human conditions -- just like you can tell a place from a postcard; only that the image you did should be more impressive and thought-provoking. Let's call it a "genius loci image". Surely, it will stand you in good stead for the practice to limit your themes to a few. (Camera: Samsung WB600 w/ in-camera effects)The traffic light turns red just as the calendar of today does so. In effect, they are saying stop.This is Sunday. Slow down and stop.